In this week’s Dig column, we shared a recipe for limoncello from the recently published LUSCIOUS LIQUEURS by our pal A.J. Rathbun. The batch I made is steeping away in my closet and will be for the next four weeks, ready just in time for me to bottle it up and gift it to friends and family this holiday season. 1. Put all of the ingredients in any order you want in a sturdy blender. Blend on medium for 1 minute, making sure that everything is completely combined. 2. Pour the mixture into 1 large (at least 1 1/2 liters) bottle or a number of smaller bottles or jars with tight fitting lids. Seal and refrigerate before using (it can also be placed in the freezer, but it might get slushy). You can serve this right away, and please consume within 2 weeks. Check back in a few weeks to find out how the great limoncello experiment turned out. 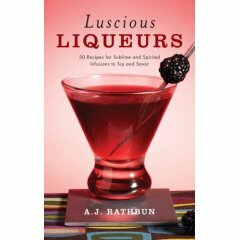 *Excerpted from Luscious Liqueurs, by A.J. Rathbun. (c) 2008, used by permission from The Harvard Common Press.